Lucasfilm's ILMxLab has revealed the first look at the Star Wars VR experience Vader Immortal. Back in 2016, Industrial Light and Magic's xLab team announced that they were working with David S. Goyer to create a VR experience featuring Darth Vader. And now, the team are getting ready to launch the first episode of the series this spring and the trailer looks pretty awesome, taking place before the events of A New Hope. The new VR experience takes users to Mustafar, which is the home of Darth Vader's castle. 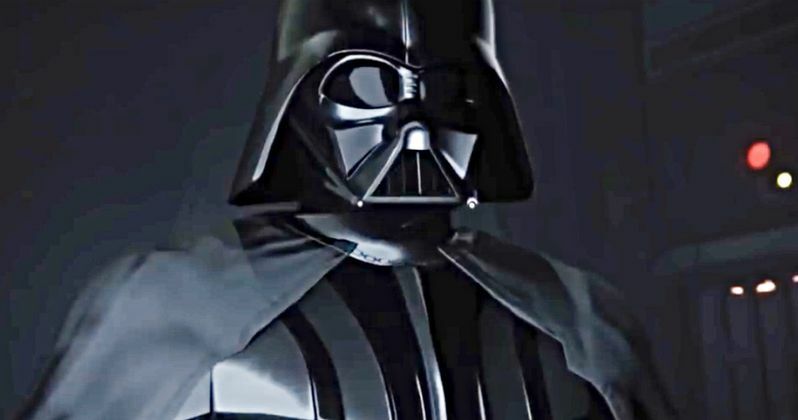 Vader Immortal was revealed at Facebook's Oculus Connect 2018 event in California and we now have the official trailer to watch online. David S. Goyer says that the three-part series was designed to be as immersive as possible for Star Wars fans, and from the looks of the trailer, they've accomplished that goal. ILMxLab's executive in charge Vicki Dobbs Beck took some time to discuss the VR experience. She had this to say. "Our mission at ILMxLab is to have fans step inside our stories, and Vader Immortal: A Star Wars VR Series represents a significant step forward in that ongoing quest. Our friends at Oculus share ILMxLab's ambition to bring compelling immersive narratives to life and using Oculus' hardware, we will invite fans to experience Darth Vader as never before." Star Wars fanatics are going to be able to enter Mustafar and interact with their surroundings in the Vader Immortal VR experience. The trailer shows off the inside of Vader's castle as he personally welcomes you. For the time being, the experience is going to be exclusive to Facebook's Oculus Quest, but may later come out on other platforms in the future. The headset costs $399 and is scheduled to ship in early 2019. Additionally, consumers will reportedly have access to over 50 games and applications at the time of the launch. ILMxLab got involved in the Star Wars VR experiences early with the basic Lightsaber game, Trials on Tatooine, which was pretty awesome, even as a basic game. Users were magically taken to Tatooine and had to protect R2-D2. The company later put out Star Wars: Secrets of the Empire immersive VR installations, which was a step up from Trials, but both of them are going to pale in comparison to Vader Immortal when it becomes available early next year. ILMxLab have been taking their time to craft the Vader Immortal VR experience and the trailer proves that. It's going to be very interesting to see what the actual experience is like on the new Oculus Quest system. There's still a bit of wait before Facebook releases the set, so Star Wars fans have plenty of time to save up some cash to pay the hefty price tag for the headset. You can check out the first trailer for Vader Immortal below, thanks to the Upload VR YouTube channel.